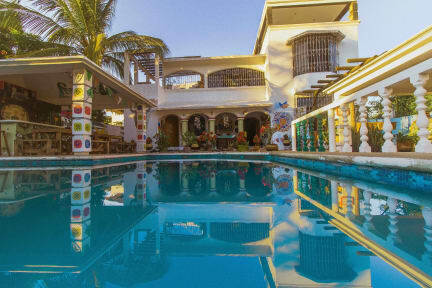 Vivo Escondido Hostel i Puerto Escondido, Mexiko : Boka nu! Vivo Escondido hostel is one of the best hostels I have stayed at. Super friendly staff and an homey atmosphere. It’s the kind of hostel where backpackers extend their stay and where creativity is encouraged. The whole place is filled with murals made by volounters and visitors and me myself got to paint one too. If it’s for two days or two weeks you’re staying it doesn’t matter. The open layout of the house with the pool and bar helps create a perfect place to hang out and meet new people. This used to be the best hostel in Puerto Escondido but now I don't really know what happened. Someone told me something about change of management and that's most likely the problem. The pool is falling apart and the staff seems more into their own life and struggles than taking care of the place. Some of the staff absolutely amazing to hang around with but it feels more like the house of some friends that don't really care. Too bad because it's such a cool place with great location.